Colt hates the cold, and he's pretty miserable in the days leading up to Christmas. He moved to Michigan from Texas three years ago, and he misses the more moderate weather and his family. He doesn't miss his ex, but he's tired of being alone too. Enter Roger, a smart little pup who looks like a Jack Russell Terrier but is really a Feist. Roger is well mannered and cuddly. Even though Colt searches for Roger's parent and even considers taking Roger to a shelter, he secretly hopes Roger can stay. Roger brings much needed joy to Colt's life. It isn't until two-thirds into the story (nearly the last chapter) that Roger meets Killian. The men interact twice before the story ends. There are no lingering glances, no kisses, no anticipation of any kind. Since the story lacks relationship development, the sweet epilogue feels ho-hum. This is a cute holiday story, but the focus is on boy and dog rather than boy and boy. 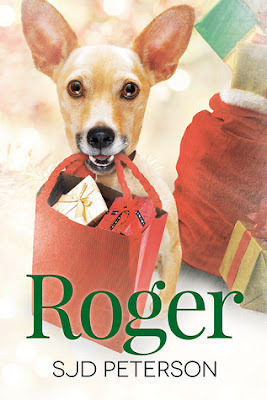 Because I love dogs, I still enjoyed it, but if you're hoping for a romance and are not a dog person, Roger might not be the story for you.